A typhoon expected to take an unusual route across Japan is forecast to make landfall on Honshu over the weekend, with the Meteorological Agency calling for people in western Japan to be extra vigilant for further landslides and flooding after the rain disaster earlier this month. 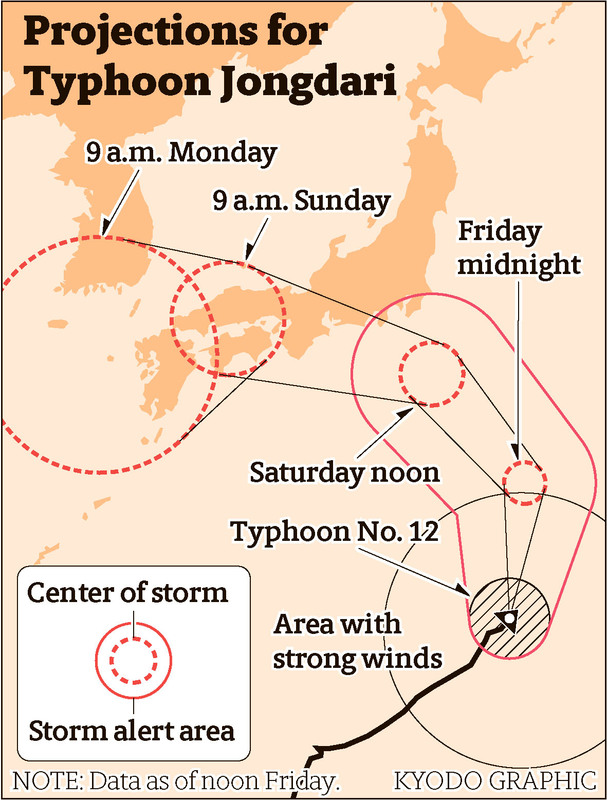 The storm is likely to gradually shift northwest and gain speed as it approaches Kanto on Saturday afternoon, before swerving west toward central and storm-hit western Japan through Sunday, said Ryuta Kurora, the agency’s chief forecaster. At an emergency news conference, Kurora warned of flooding, landslides, high waves and strong winds, and urged people to check neighborhood hazard maps to prepare if governments issue evacuation warnings. He also emphasized the importance of keeping abreast of the latest information because the typhoon may take a course different from the forecast. Two days ago, Jongdari, which means skylark in Korean, was predicted to traverse Honshu from southeast to northwest while en route to the Sea of Japan. The typhoon could bring up to 500 millimeters of rain to eastern Japan, up to 400 mm to central Japan and 300 mm to western Japan over a 24-hour period ending noon Sunday. Earlier this month, western Japan was hit by torrential rains that caused extensive flooding and mudslides that killed more than 220 people in 15 prefectures, including Hiroshima and Okayama. “Special caution is necessary in areas hit by the torrential rains in western Japan where landslides and flooding can easily occur,” Kurora said. In the city of Kurashiki in Okayama, a city-run volunteer center decided to cancel its activities from Saturday to Monday. “The typhoon is forecast to hit Okayama on Sunday, but residents must evacuate early and if volunteers come out on Saturday they would have to come out to their homes, and that could hinder their evacuation,” said Toshifumi Ohashi, a Kurashiki city official dispatched to the center. Ohashi said Monday’s activities, which mainly involve cleaning flood-hit homes, were also called off as residents might be busy dealing with the aftermath be unprepared to accept volunteers. 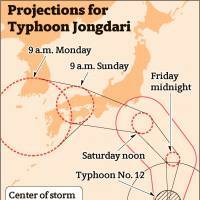 While typhoons usually move northeast when they near Japan and the weather often becomes dry and pleasant after they pass, Kurora said Jongdari’s westward movement means it will likely be followed by unstable weather, including downpours and tornadoes. Meanwhile, Prime Minister Shinzo Abe told a government meeting dealing with the western Japan rain disaster that people should be on heightened alert regarding the approaching typhoon. The Sumida River Fireworks Festival, which had been scheduled for Saturday, was postponed by a day. Organizers in Tokyo said they will decide whether to proceed with the annual festival by 6 p.m. Sunday. Another fireworks show scheduled for Saturday at Showa Kinen Park in Tachikawa, Tokyo, was canceled, organizers said.